In part one, we’ll uncover the extreme challenges of air travel for people with disabilities, the risky measures they take in order to fly, and the serious harm they face every time they board an aircraft. 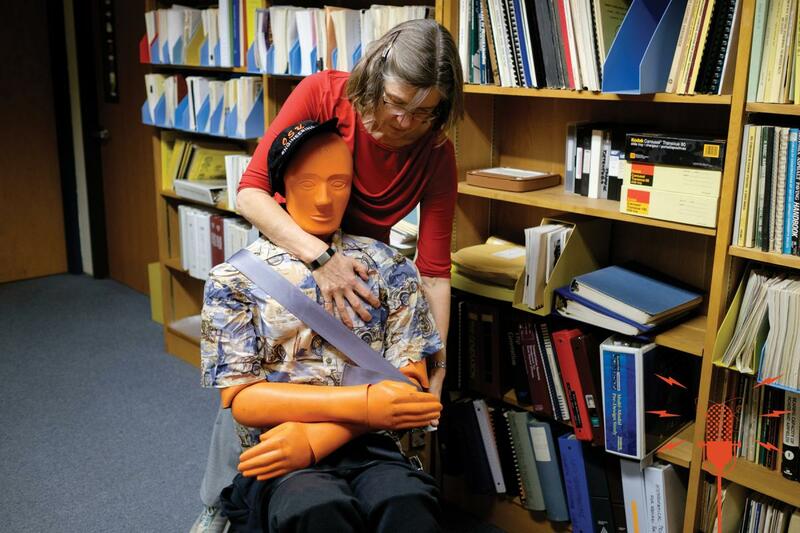 And we’ll meet Associate Professor Katharine Hunter-Zaworski who, for more than three decades, has been fighting to remove barriers and improve access to transportation for people with disabilities. By observing crashes, researchers can make recommendations on how to prevent them and ultimately make roads safer for more users. Crashes, however, are difficult to predict and to observe. 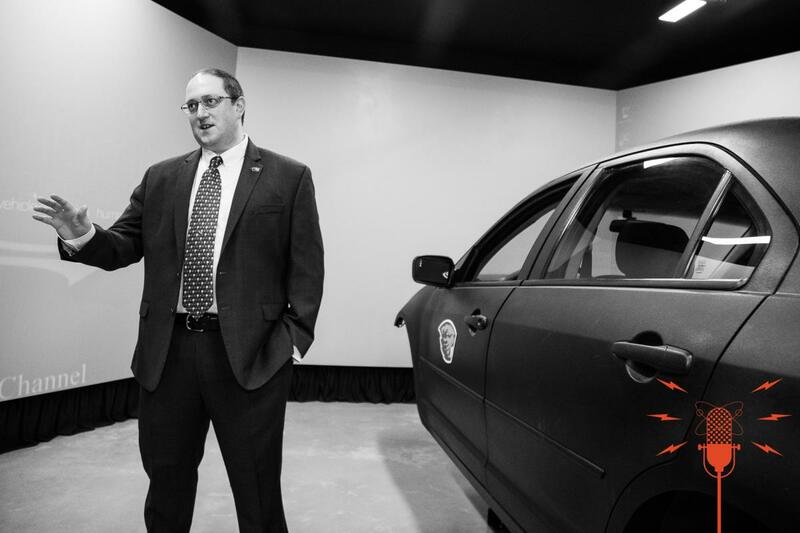 In part two, we tour the Driving and Bicycling Simulator where Associate Professor David Hurwitz conducts experiments on right-hook crashes in a virtual environment. STEVE FRANDZEL: You’re passing through 10,000 feet. Before the flight attendants role out their carts & block the aisle, you head to the lavatory. The tiny compartment is as cramped as ever – not even enough room to bend over the tiny basin to splash your face. At least it’s still clean. Then, back to your seat to settle in for the rest of the three-hour flight. Most of us take this routine hassle of air travel for granted. But it could be worse, much worse. What if there was no onboard bathroom? At all. And you don’t land for hours. It sounds like a nightmare, but that’s effectively what people in wheelchairs face, because many lavatories are far too small to accommodate them. Those still bold enough to fly under such circumstances may take extraordinary measures. KATHARINE HUNTER-ZAWORSKI: Because the lavatories are not accessible, they can’t use them, so before they fly they usually have to stop eating and drinking 24 hours ahead of flying. They can’t drink at all during the time their flying. They put themselves at physical risk because of the precautions they have to take prior to a trip. HUNTER-ZAWORSKI: Rehabilitation engineering is a very broad field that is the development and deployment of assistive technology for people with disabilities – technology to enable people to live full and independent lives. In the course of my practice of rehabilitation engineering I was exposed to the needs of transportation, and I realized that accessible transportation is essential for independence. Accessible transportation enables people to get an education, to go to work, to live independently, and really to have full inclusion. FRANDZEL: Despite notable progress on the ground, the skies remain a daunting place for travelers with disabilities. The 1986 Air Carrier Access Act, which requires airlines to accommodate the needs of passengers with disabilities, mandates accessible lavatories on twin-aisle aircraft. But it doesn’t cover single-aisle planes, which dominate domestic routes. And oddly, the Act doesn’t even define what constitutes an accessible lavatory. HUNTER-ZAWORSKI: I’ve been frustrated for a number of years because there really were no parameters to specify what is an accessible lavatory. Even if you fly on a twin aisle aircraft and you see the little sticker that says Accessible lav, there’s no guarantee that it’s accessible, because there’s no provisions. FRANDZEL: Another strategy travelers use to cope with inaccessible lavatories is booking multiple short flights instead of one long one. HUNTER-ZAWORSKI: Depending on the length of the trip, but sometimes people will do a stopover so they can use the lavatory. So instead of taking a six-hour nonstop, they will choose to break it up into two pieces – two three-hour flights, and go through all the process of boarding and unboarding just to avoid having to be dehydrated and stop eating and all those sorts of things. FRANDZEL: Other parts of their trip can be downright dangerous. HUNTER-ZAWORSKI: …they would be transferred to the onboard wheelchair and taken back to the lavatory. So everyone of those transfers is hazardous and can bring around injury. The risk to the person is that of being dropped or having their rear end hit something. FRANDZEL: One man reported that his wife broke her arm during such an assisted transfer. HUNTER-ZAWORSKI: We’re party to information that that’s a pretty minor injury from some of the things that we’ve seen. FRANDZEL: Onboard wheelchairs supplied by airlines also leave a lot to be desired. HUNTER-ZAWORSKI: So airlines want them to be as small as possible and as light as possible. And the problem with that is that some of these chairs that are very small and very light, they don’t provide any support for the person that’s in the chair, or they’re very low. And the surface of that chair is hard, so when you transfer a person from an airline seat to that hard surface, you have the likelihood of soft tissue damage. FRANDZEL: Hunter-Zaworski’s first foray into accessible transportation began on the ground in Canada in the early 80s when she helped to plan Skytrain, Vancouver’s ambitious and highly accessible metropolitan transportation system. HUNTER-ZAWORSKI: Skytrain was a little desperate, because they had been ordered by the provincial government to be barrier free, or to be accessible. But they came to me and said do you think you could help us, and they said I think it will take you about six weeks, and I said Well, let’s try. Six weeks morphed into six years – really morphed into 30 years of ongoing work. So there was a commitment from the very top to make this work, to make this accessible, and that made a huge difference. So there was an attitude from the outset that this was going to be barrier free, no matter what the cost, and it was going to work. FRANDZEL: And it did. Skytrain is still considered among the most highly accessible transportation systems in North America, integrating light rail, busses, and even ferries. HUNTER-ZAWORSKI: You have a completely seamless transportation system. You can go anywhere. The busses are accessible, it’s just a very easy city to get around in if you happen to be a person that uses a wheelchair. FRANDZEL: Hunter-Zaworski turned her attention to the sky in 1991 when she was appointed to a federal advisory committee that examined lavatory accessibility on single-aisle aircraft. Unfortunately, the findings were shelved. Jump to the summer of 2016. Hunter-Zaworski was appointed to yet another advisory committee on accessible air transportation convened by the U.S. Department of Transportation. She co-chaired the Accessible Lavatories Working Group. HUNTER-ZAWORSKI: We are starting again many years later to try to move the needle on accessibility on single-aisle aircraft. FRANDZEL: The 26-member committee was made up of airline industry representatives and disability rights advocates. Hunter-Zaworski found herself in the middle trying to pull the divergent factions toward consensus. It wouldn’t be easy, but this time she would not come up empty. HUNTER-ZAWORSKI: Real estate on aircraft is the most expensive real estate in the world. And on single aisles it is probably the most expensive real estate. And to put that in context, an aircraft seat, that last one at the back of the aircraft that’s really uncomfortable and right by the potty, is about a million, a million and a half dollars a year to the airlines. So they are very very reluctant to give up any real estate, particularly for such things as accessible rest rooms. FRANDZEL: As the only academic on the committee, Hunter-Zaworski found herself in an interesting position as an intermediary. HUNTER-ZAWORSKI: It was a very challenging to increase understanding on both sides. So to help the advocates come to an understanding of the challenges of design on an aircraft, and at the same time working with the industry and the manufacturers to realize the frustration on the part of the advocates who’ve been waiting for 30 years to be able to have an accessible lav on a single aisle aircraft. I said we want an accessible lav for a 95th percentile male and at the end of the day we got what we asked for. FRANDZEL: A 95th percentile male is about 6’1”, 210 pounds. Hunter-Zaworski hopes that the new rules take effect within a year. They don’t need congressional approval. Once they’re rolled out, airlines will have to remove accessibility labels from lavatories that don’t meet the new regulations. Over the long term, they’ll have a greater impact, and in 20 years, all new aircraft – that means new designs – will have to have an accessible lav on it. For much of her career, Hunter-Zaworski has worked closely with aircraft manufacturers on the design of accessible lavatories for single-aisle aircraft. When making the rounds, she’s often accompanied by her loyal assistant, Ted, who has suffered numerous injuries, including a broken neck, in the line of duty. But he’s a tough guy, he never complains, and he never files workers comp. HUNTER-ZAWORSKI: Ted! Ted is our crash test dummy. He’s a 50th percentile male, he ways 170 pounds, he’s bright orange, he’s an anthropomorphic test dummy, so his weight is distributed appropriately. He’s rigid, he’s stiff, so he in some ways mimics somebody with a high level of spasticity. He can be very difficult to load back into a wheelchair when he’s fallen out of a wheelchair. And he’s broken his neck multiple times. FRANDZEL: Why name him ted? That’s simple. HUNTER-ZAWORSKI: Well, he is a transportation engineering dummy. He’s really been a great tool to educate people on the needs of people with disabilities. He spent a month at Boeing and the engineers came back and said “You know, we learned a lot from having Ted stay here for a month,” and I thought they would. They learned how hard is was to do transfers. He did go on a field trip with me this summer, and people learned a huge amount about boarding – getting him on and off aircraft. He was not popular, and they realized how hard it was to move somebody on and off an aircraft. FRANDZEL: Popular or not, people remember Ted. HUNTER-ZAWORSKI: So I have to be very careful to warn people ahead of time. One time we didn’t. We were up in Seattle, my husband and I. Ted was in the back seat of a car and we did valet parking because it was easy. And the poor person that drove our car up in the morning was a white as a sheet, and we’d forgotten to tell him about the fact that Ted was sitting in the back seat. FRANDZEL: There’s still much work ahead for Hunter-Zaworski and Ted. Progress has been halting, but it is has come. A glimpse into a more heartening future is flying on some newer single-aisle airplanes. One design consists of two adjacent lavatories that merge to form a single larger compartment big enough to fit a wheelchair, its occupant and a companion, thus qualifying as truly accessible – though Hunter-Zaworski really prefers the term inclusive. HUNTER-ZAWORSKI: Accessible often just means something for a person with a disability. I like to broaden it and think about let’s be inclusive. So this was a conversation I had with Boeing early on in the design of the Dreamliner. I said if we just call it a handicapped or accessible lav, no one is going to buy it. But I said if you call it an inclusive lav, generally people will be much more interested, and by that I mean it accommodates families with small children, it accommodates somebody who is obese, and by the way it also accommodates somebody who uses the onboard wheelchair. When you start thinking about people, many many many people travel with small children, and they need to use the lavatory. And having just a little bit more room makes a world of difference. FRANDZEL : Recline your seat backs and settle in for Part 2, where we’ll look into innovative plans to make our roads safer for everyone. JOHANNA CARSON: Welcome to part 2 of the podcast. 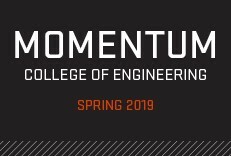 I’m Johanna Carson from the College of Engineering at Oregon State. Whether your mode is by car or by bike, you’ve probably had close calls – or worse, navigating city streets. RACHEL ROBERTSON: You know what, in fact, it just happened to me today. ROBERTSON: So, I’m riding my bike down King’s Street on my way to campus. And I’m approaching the intersection at Grant. The light is green, so cars are passing me, and as I enter the intersection a big van turns right in front of me. CARSON: That could have been a right-hook crash. That’s scary. We are going to learn more about those later in the episode. CARSON: Like Rachel, many people commute by bike. In fact, bike commuting has risen 60 percent in the last decade, according to the US Census Bureau and is the highest in the West. Among large cities Portland has the highest bicycle commuting rate. HURWITZ: Oregon stands a bit unique-- we spend state highway dollars on bicycle and multi-modal transportation infrastructure. So, compared to many other states in the country, we bring more cyclists and pedestrians into conflict with motor vehicles. So, being situated here in Corvallis, we're well-positioned to try and make research advancements. 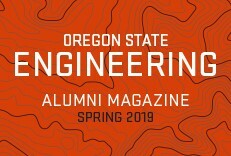 CARSON: That was David Hurwitz, associate professor of transportation engineering at Oregon State, and he’s working to make our roads safer and more inclusive for different modes of travel. In this segment, he’ll talk about his research on reducing crashes between drivers and cyclists, or as those in the field call them, mixed-mode crashes. HURWITZ: One of the things that our lab's been really interested in over the last number is crash causality. And when you think about crashes as a phenomenon, they are difficult to predict, and difficult to observe. So, in order to understand the why's around what's causing certain types of crashes, we need large samples and need high-fidelity data and one method to acquire that information is in the virtual environment because we can take large subject populations that can be authentically matched to, say, the driving population of licensed drivers in the state of Oregon, and we can expose them to risky scenarios- scenarios that would potentially cause them harm in the real world, and we can understand what they're doing in the moments that lead up to a particular crash type. And in doing so, understand more about why those crashes are occurring and what we can do, as transportation professionals, to help mitigate their occurrence the real world. CARSON: The virtual environment David works in is the Driving and Bicycling Simulator, located on campus. Each full-scale – life size - simulator sits in its own room, where a vehicle and bicycle can navigate a simulated environment, that looks like the real world. Walking into the simulator on campus, you’ll probably find the lab humming with activity as researchers conduct their experiments. Graduate student, Kayla Fleskes gave us a tour of the car simulator. FLESKES: So, this is our main simulator, a Ford Focus cab and we can set it up to drive in different environments that we want to drive around in. CARSON: Floor-to-ceiling screens, surround-sound and subtle movements of the car as you accelerate and decelerate, all contribute to making the experience feel authentic. FLESKES: You definitely feel like you are moving because you have these screens completely surrounding you in the front and then in both of the side mirrors there are monitors so it looks like you are driving a car as you normally would. And same with the rear projector, so if I look in my rear view mirror, it looks like I’m driving along on the road and there is a vehicle following me. Right now I’m driving on one of our generic – through one of our generic environments. So, this one is sort of a rural road that is running through maybe a small, a typical small town. I’m following a couple of vehicles and there are a few that are behind me. So, those vehicles populate themselves in the environment. And in the environments that we code ourselves we can control them and have them do very specific things. So that we can run our experiments. CARSON: Graduate student, Dylan Horne demonstrated the bicycle simulator that can accommodate a variety of riders. HORNE: The bicycles are interchangeable. There is like a stationary bike trainer that the rear wheel turns. There is a sensor that is tied to that, that inputs the speed into the computer and there is another sensor that is connected to the front wheel so you get the steering of the bicycle. Part of what I’m working on is validating the experience here on the simulator compared to the real world experience of riding a bike to try to match those up to make it more representative when we actually do run experiments. The real advantage of being in a simulator like this that in the real world if there is a collision and it leads to severe injury generally for cyclists, but in this environment you don’t have those same risks, so you can try new novel concepts and see how people respond to that. CARSON: The simulation lab is pretty fabulous, and if want to see pictures and more information on it, you can visit the episode page at engineeringoutloud.oregonstate.edu. Now back to the crashes that David is working to reduce. HURWITZ: These mixed-mode conflicts tend to be more severe than other types of crash-conflicts, in part because of the lack of safety equipment that a pedestrian or a bicyclist has access to. They're not surrounded by thousands of pounds of crash-designed vehicle systems, so they're at risk. They are what some would term vulnerable populations. So, one set of investigations looked at vehicle-bicycle conflicts and our entry point into that space was considering the right-hook crash. CARSON: A right-hook crash is a type of collision that occurs at an intersection, between a car and bicyclist. It can occur at any type of intersection, whether there's a traffic signal, a stop sign, or even a driveway. The "right-hook" describes a vehicle that is approaching that intersection, with the intention of turning right and an adjacent bicyclist is trying to simultaneously move through the intersection -- the right turning vehicle collides with the bicyclist. So, in the simulator, David ran a series of experiments on right-hook crashes. HURWITZ: The design of our investigation started by asking the question what are the causal factors that contribute to the occurrence of a right-hook crash? Because, if we better understand why right-hook crashes occur, we can design more effective treatments to prevent them from occurring in the future. So, as we look at the crashes that occurred in that first experiment, of which there were twenty-six, we found that two-thirds of the time, the drivers simply didn't look for an adjacent bicycle before they turned, and that lack of visual search caused, or at a minimum contributed to, that crash outcome. In addition to not looking the presence of the adjacent bicyclist, approximately five percent of the time, the driver looked but didn't see. They were trying to scan the built environment for the vulnerable hazard - the adjacent bicyclist - and they fixated on that bicyclist, but cognitively, it didn't register as a bicyclist who was going to be in conflict with their forward maneuver. And then about a third of the time, the driver detected correctly the presence of the bicyclist, but believed the bicyclist would yield the right of way, that the bicyclist would slow down and stop, and let the car proceed, or the driver believed they had enough time and space to complete their maneuver before the crash conflict would occur. So, that pattern of decision-making and perception that we've defined as situational awareness gave us some understanding, but on a relatively small sample size. We only got to observe twenty-six crashes. So, we expanded our definition, and we also looked at near-misses. CARSON: When David and his team looked at the near-miss cases, which added another 28 observations, they saw a very similar pattern of results. Again, a whopping two-thirds of the drivers are simply not looking. Something to keep in the back of your mind when you are driving about. ROBERTSON: Yes, uh, please look for me. I’m there. CARSON: Yes, please look for Rachel and all the other cyclists. CARSON: And now, this research can have different impacts for the traveling public, such as the adoption of new guidelines on the configuration and placement of traffic control lights, and the symbols that are used – all for the purpose of increasing the safety. HURWITZ: In coordination with a variety of different design and operations engineers at the Oregon Department of Transportation, we considered a variety of signage treatments, pavement-marking treatments related to the continuation of the bicycle lane across the intersection. We looked at the radius of the curbs at the intersection, where the curb returns, and we also considered protected intersection orientations. So, four categories of treatments in a separate, stand-alone experiment. CARSON: What's a protected intersection? HURWITZ: So, that's an interesting question. They've also been called Dutch intersections- it's a European design that provides additional, positive separation between the motor vehiclists' turning movements and the alignment and orientation of the bicycle lane. CARSON: So, this is using paint to protect the bicyclist? HURWITZ: There's a variety of different ways to do it; so, the pavement markings are one component- there are also physical islands that can separate the car movement from the bike movement, providing additional protection, forcing a particular path for the car turning right, and realigning the position of the bicyclist. It basically moves the bicyclist forward into the field of view of the motorist, and increases…well, one potential benefit of this arrangement is that it increases their visibility for a right-turning motorist. Our findings can also contribute to improved educational trainings for all road users - peds, bikes, trucks, drivers, transit riders, to help reduce negative outcomes from interacting with the built environment. So, those are two obvious immediate outcomes. CARSON: This episode was produced by Steve Frandzel, Rachel Robertson, and me, Johanna Carson, with additional editing by Miriah Reddington. Our intro music is The Ether Bunny by Eyes Closed Audio on SoundCloud and used with permission of a Creative Commons attribution license. Other music and effects in this episode include Time: Disabled by Maxim Kornyshev, Decisions by Kevin MacLeod, and car crash by nsstudios on Freesound.org., all used with permission of a Creative Commons attribution license. We also used The Four Seasons, by Vivaldi, recorded by John Harrison with the Wichita State University Chamber Players, with permission of a Creative Commons share-alike license. 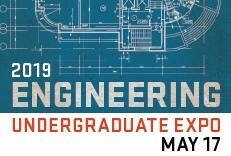 For more episodes visit engineeringoutloud.oregonstate.edu or subscribe by searching “Engineering Out Loud” on your favorite podcast app.